These are the best bike lights to see and be seen with. We’ve got everything covered, from tiny LEDs to use as back-up, to high-powered flood lights for the middle of the night. Having the best front light for your bike is essential if you're going to venture onto our highways at night especially as our city streets are both thick with traffic and trafficked by the thick. Now we're in the depths of winter it gets dark frighteningly early, too. Fitting a good front light to your bike is essential if you want to ride through the sun-starved days of winter. 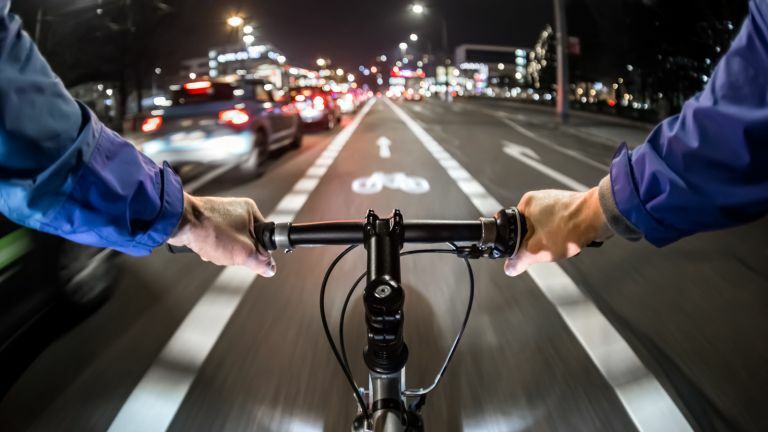 British law states that cyclists on the road after dark must have a white front light and a red rear light if they are to avoid a stern word from the local bobby. But it’s also just common sense - if you’re riding at night (or dusk/dawn), an appropriately-powered light will help motorists spot you on the road. In fact, even the daytime can be so overcast as to warrant using your lights, so now's the time to invest in some illumination. On top of that, if the weather conditions turn and you’re suddenly riding through torrential rain, your lights will help make you stand out in the sodden gloom. Not only does a light allow oncoming road users to pinpoint your vulnerable self, it also lights up the road ahead so you can actually see where you're going and avoid those pesky potholes. Modern LED bike lights are a world away from the big old battery lights of yesteryear, packing a potently powerful beam into a little unit that you simply recharge via USB. High-powered lights are more affordable than ever, too, so there’s little excuse for not ensuring you’re well-equipped. You’ll find lights out there for all kinds of budgets, from cash-strapped commuters to lycra-clad, performance-obsessed road cyclists who want another gadget to strap to their five-figure carbon machine. Lights vary significantly in power and what one rider needs may be very different to the next. With that in mind, here is our pick of the best front bike lights to keep you safe out on the road. Which is the best cycle light? We've been thoroughly impressed with Lezyne's most recent releases and its Hecto Drive 400XL offers great illumination at a very reasonable price. For cyclists riding through towns and cities, the Hecto Drive offers ample power, with a sensible range of modes and a sleek design. Choosing an outright winner is a tough call, due to the varying requirements and preferences cyclists have. For example, if you’re regularly riding on unlit roads or cycle paths, you will need more power than the Hecto Drive’s 400-lumen maximum output – something like the Exposure Strada SL for instance. As a general rule, we find you seldom go wrong with Exposure, Cateye and Lezyne offerings. The Laserlight Core from Beryl (the British lighting brand formerly known as Blaze) is perhaps not the greatest standalone headlight but its briliiant USP – beaming an image of a bike onto the road ahead – can come in very handy indeed on urban night rides through Babylon. The first thing to say about bike lights is that unless you are going off-roading at night or you ride on unlit roads, brighter isn't necessarily better. Providing you’ve got enough power, the key things to consider are battery life and how well shaped the front beam is in order to attract the attention of other road users. In town, an LED front bike light rated at 300-500 lumens is more than adequate. On the rear, 60-70 is fine. That said, most modern front lights have multiple power modes, so you could buy something more powerful (1,000 lumens, say) and run it on a lower setting, preserving the battery life and keeping the full beam in reserve for foggy nights or when riding on dark country lanes. That’s a sensible strategy - you don’t always need to use your light’s most powerful setting, just because it’s there. All of the lights featured here will come with constant and flashing settings. There’s not necessarily a right or wrong option, though flashing patterns will use less battery, while a constant beam will drain your light’s juice at a faster rate. That said, a constant beam can make it easier for other road users to judge the distance between you and them, which is certainly no bad thing. More advanced lights may offer a pulsing mode, which looks to combine the best of both worlds, while some cyclists will choose to run two lights at the same time: one constant and one flashing. With lights becoming cheaper by the year, that’s not a bad shout and means you always have a back-up ready. Helmet lights are increasingly popular, with good reason – as well as ensuring you can be seen over the bonnets of the gleaming Chelsea tractors revving at the traffic lights, they're handy as a torch if you need to rummage in the depths of your backpack/trendy messenger bag after dark. You can also use a helmet light to point in the direction you want to go, rather than the directly where your bike is currently facing. What is definitely irritating for other road users is shining one of today's high-powered LED beams straight in their eyes; so for heaven's sake, please point your god-damn front light downwards. Thanks. Fitment will depend on the layout of your bike's cockpit but do take the time to ensure your light is secured well, so it doesn't start to droop or even fall off the first time you hit a bump. Otherwise you can expect to see your light crashing down the road and under the wheels of a truck. Most clamps these days are easy to use and can be quickly removed, whether that’s to switch your light between bikes, or to deter the wandering hands of thieves. One final thing to note is that most front lights are now USB rechargeable - a massive bonus, considering you can just stick it on charge when you get into the office or home from a ride. If you remember, that is. Being rechargeable is great and all, but it does mean that once you're on the road, you can't just whack in a new pair of AAs if you run out of juice. However, the best bike lights will use LEDs to indicate how much battery life you have left, so there really is no excuse. Lezyne steals the urban night ride crown from previous chart-topper Light and Motion with the latest version of its Hecto Drive, by virtue of much longer battery life and a flatter, better balanced profile. Battery technology has come on leaps and bounds in recent years and this latest model from Lezyne makes the most out of a Li-Poly set-up to deliver up to 17.5 hours of light at its lowest output setting. It's a doddle to set up, with a simple rubber strap that's suitable for most styles of handlebar, while the easy-to-remove base is great for slipping into a backpack when not in use. Fashioned from heat-dissipating CNC machined aluminium, it is designed to last, although we have certainly found other models that are built from sturdier stuff, so we wouldn't suggest dropping it under a bus. But then we'd never suggest that. The integrated USB charging stick is a killer feature, making locating a charging cable redundant, although it means you'll need to choose an external battery carefully if you ever want to charge while riding. You might also find it's tricky to plug directly into a laptop or wall socket, so consider buying a male-to-female USB lead. The price of the Lezyne is extremely competitive considering its quality. The Exposure Strada SL has a maximum output of 900 lumens, which is comfortably bright enough to light the way on dark country lanes. In fact, for most riders, this is all the light you’ll ever need. Not only that, but the Strada SL has a road-specific beam pattern, throwing out a spread of light designed to provide maximum illumination while not dazzling other road users. The Strada SL has seven settings in all, including a daytime-specific flashing mode, with battery life falling anywhere between two hours and 36 hours. It’s a clever bit of kit, too, with the rear display showing how much burn time you have left for your selected mode, plus there are additional traffic light-coloured LEDs. There’s no getting away from the fact that the Strada SL is pricey, even for a 900-lumen light, but what sets Exposure’s design apart is the build quality. The CNC-machined unit is finished to the highest standard and comes with a quality quick-release bracket. It’s made in Britain, too. This light is the successor the Blaze Laserlight – due to some legal unfortunateness, Blaze is now Beryl (it's a long story), and this 'Core' version of the light has been vastly improved over the original. As seen on London's fleet of on-street hire bikes (the ones with docks, not the ones that end up in the Thames or on fire), the Blaze – sorry, Beryl – combines a standard, max 400-lumen LED light with a green laser, which beams the image of a bike about 2m in front of you as you ride. This alerts other road users to your presence more effectively than a light alone, or you shouting "gerroutathefugginway". This one is much lighter, better balanced and easy to mount than the original, and the battery life is generally pretty good. You'll get up to 13 hours with a flashing LED and flashing laser on, and we found that to be plenty of illumination. However, if you absolutely must have a constant, non-flashing light and laser, it reduces all the way down to just 1.5 hours. Recharging is quick and easy via micro USB, happily. Lezyne’s lights are some of the best in the business and the Lite Drive 800XL is another brilliant lamp. Eight modes and a maximum output of 800 lumens ensure it’s an extremely bright light, capable of illuminating unlit roads as well as being used for the commute through town. The most powerful mode only has a burn time of 80 minutes so if you need the full 800 lumens, there are more efficient lights out there. Step down to 400 lumens and you’ll be in action for three hours, while still having the security of the top setting should things get really dark. The design is compact enough and looks good on the bike. The rubber mount is quick and easy to use, but it’s not removable: the light and mount are attached to one another. Still, this versatile light is at a great price, so we can live with that. Knog has a well-earned reputation for stylish and convenient bike lights, ideal for city riders, and the new Plus is no different. This sleek little number can be mounted to your bike (whether that’s on the handlebar or fork) or worn on your body using the integrated clip. That makes it a good option for joggers and trail runners, as well as cyclists. With a maximum output of only 40 lumens, the Plus is best used as back-up illumination, whether you need a small light to keep with you just in case you get caught out, or you want a second light to run alongside your main lamp. Handily, the Plus is USB rechargeable, and as you can see in the image above, there’s a rear version which can be bought with this front light as a twin pack. Balancing brightness with budget, this tough little unit from lock masters Kryptonite keeps the price at a reasonable level by reducing the lumens level over some of its key rivals. The Street F-450 features six different light modes to match various environments, from illuminating High Steady to an energy conserving Economic Flash, which ekes out 24 hours of light from the on-board batteries. Again, recharging is as simple as plugging it into a USB slot as soon as you get to work or arrive back home. We couldn't not feature this hulking brute of a front lamp, simply because it kicks out a truly staggering 6000 lumens, which is enough to make a farmer's track at midnight look like a summer's day in California. Designed with serious endurance racing in mind, the Cateye Volt 6000 comes with its own separate remote control, which is also rechargeable and lasts around two months before it has to be plugged in. Said remote can flick between various modes, from one-hour of full 6,000 lumen brightness, to a more sedate, 500-lumen all-night lamp. Its whopping output and cost make the Volt 6000 overkill for a regular urban commute. It also requires an external battery that can only be charged/discharged around 300 times before performance starts to drop. Its squashed, rubbery exterior might not be the most aesthetically pleasing piece of design around, but the Moon Meteor works well and boasts a battery life of up to 30 hours on the most economical settings. The 48-degree beam angle lights up plenty of the road ahead, while the most powerful 300 lumens steady light is great for illuminating those roads and pathways not served by streetlights. Although, it only lasts about an hour and half in this mode. Never underestimate the usefulness of dynamo-powered lights. They can't run out of battery, and they can give plenty of light. This is the smallest road-legal light with an aluminium housing, but don't be fooled by its size. It's much brighter than the headline lumen rating – 205 lumens at 25kph – might suggest. That's thanks to its innovative inner housing design, which directs the heat of the LED straight to the cooling fins for maximum brightness. Forget about damage because it's sealed watertight. And if that doesn't seal the deal, it comes with a five-year warranty. German engineering, you can't beat it. One for those who favour Lycra and speed, this is near the cuttiong edge of headlamp tech. In short, the faster you go, the brighter Varia UT 800 will be, but it requires you to have already bought into the Garmin ecosystem of bicycle computers and sensors to get that full effect. For those suitably tooled up, the Varia and its rear siblings easily sync with the latest Edge computers and use speed calculated from their GPS to automatically adjust the intensity of the headlight’s beam. It will also automatically turn on or off when the computer is fired up or shut down. Visible in daylight from more than 1 mile, it's a powerful piece of kit and its slim and lightweight design means it won't play havoc with your expensive road bike's meticulously plotted aero gains.